The iPhone 3GS is Apple's current mobile flagship, but most of us using iPhone 3Gs won't be paying for the upgrade. So instead, we get the new 3.0 firmware—not such a bad deal. The free 3.0 upgrade ($10 for iPod touch users) is available today. Indeed, some of you have probably already downloaded it (and some of you have been downloading beta versions for months). Update: You may want to hold off a few days, as readers are already reporting problems due to the fact that everyone is trying to upgrade at the same time. iPhone OS 3.0 finishes many unpolished edges of the iPhone: Copy/Paste, obviously, but Spotlight Search, A2DP stereo Bluetooth, push notifications, and a long-requested landscape keyboard for text messages and email—a series of improvements that are less revolutionary than necessary to be part of the modern smartphone market. It's sort of like the iPhone was always a pretty good looking guy, but then all these other good looking guys came around so the iPhone had to beef up a bit to keep his thousands of rich girlfriends paying too much at AT&T every month. From the mainscreen, a simple swipe to the left brings you to the new Spotlight Search. You see a searchbar on top and the keyboard automatically pops up so there's no waiting. Its speed? Fast. A few letters gets you a slew of results instantly that pair down as you type. It digs through emails, apps, contacts and music/movies, then click any option and you're linked right to it. (For instance, click a song and you start playing that song). Limitations? It won't look through the contents of third party apps, like your individual Tweets, nor will it search Maps, Weather or SMS. (Note: You can disable anything that you don't want to search in settings.) But even with a few limitations, Spotlight has far more breadth than the searches available on the Pre or Android. It's impressive. There's no updating the low megapixel count of old iPhone camera hardware, but the new firmware has undoubtedly improved the experience of taking photos. While you still won't be taking shots in the dark, general lowlight performance feels greatly improved. Also notable: attaching multiple shots from your photo library to a single email is a wonderful, fluid experience. iPhone 3.0 Firmware Taking Better Pictures than 2.2.1? Good news for photos, but what about video? Sadly, Apple has chosen to save video functionality for the iPhone 3GS...even though jailbreaking the iPhone can provide existing users with video. The new A2DP stereo Bluetooth profile syncs easily and works without issues. We paired it with this iHome dock, and cranked it up. It sounded fine. And even if someone calls during streaming, no problem. It's just as smooth as when someone interrupts any iPod function. Finally, users can not just download but search their email over IMAP. In practical terms, that means you can search for a keyword in your Gmail without opening Gmail in Safari—the old workaround if you couldn't find an email. On paper, that sounds perfect. In practice, it can lag a bit (mostly when over 3G), but it's functionally adequate. Also, if you search a keyword on the server, search something else and then search that first word again, your results will still be cached. But speaking of Gmail, where is our push Gmail? It debuted on Android and has since made its way to the Pre. Calendar's big upgrade is CalDAV support, a protocol that allows you to view/edit schedules in the cloud, like Google and Yahoo calendars. In my testing, it took about 20 seconds for Google calendar to update from my phone. It's about as fast as it can be without push. SMS and Mail both get access to the long-desired landscape keyboard. And I must say, after trying them out, I never used them (intentionally) again. The real issue is that you just lose too much screen space. But hey, if it's your thing, I'm really happy for you. The new Safari gets a small but convenient upgrade with Autofill, the ability to enter address/contact info into fields automatically. (Note: Autofill doesn't appear to turn on automatically, at least not if you don't have yourself saved in your address book.) When facing one of those dreaded pages full of contact info, you click the first field, click the "autofill" button on the keyboard and presto, the fields fill in like magic. However, if you're using it to pay for something online, you'll be on your own for credit card information. If you're willing to pay $100 a year for MobileMe, one of the big perks is being able to stick it to the guy who steals your iPhone. Find My iPhone takes about 2 minutes to locate your phone on Google Maps (through MobileMe's web interface). At that point you can send an alert beep or an "Important Message," and can even and can deactivate it, or remotely wipe its contents. Of course, as Matt Buchanan explained in his earlier testing, there's a major flaw that will keep you from busting the criminal underground with the iPhone. Still, it seems pretty handy if you just dropped your phone in your friend's couch, or left it in a locale full of very honest patrons. Apple must have noticed the seemingly endless list and recording apps in their store, so they've appeased those of us who want to jot down a quick note with their Voice Memo and Notes apps. Voice Memo is a simple voice recorder that is really no better than any third party solution we've used (it's adequate for an interview in a pinch, but worse than most standalone mics). And Notes, while present in older versions of iPhone software, can now be synced to your computer (via USB). It's either me or just that Apple hates me. But I find it very hard to change an iTunes song with a shake-induced shuffle. It's like I'm trying to break the neck of a kitten. But every time I drop the iPhone to my side after texting? The iPhone attempts to "undo" the message, which it can't since the message is already sent. Luckily, the iPod controls can be disabled. The "undo" command cannot. It's so great watching my devastated portfolio in the new landscape mode! Many have already discussed Copy/Paste, but it would be impossible to review 3.0 without making a mention of Apple's response to the greatest gripe of their platform. Copy/Paste works. It's not as elegant as I'd hoped, given how long we've waited, but like I said, it works. Click a word/sentence, the magnifier comes up, unclick and you'll have the option to "copy." A bar on each side of the word can be stretched to include more text; copy, and you are set. Stretching the boundaries of text can be a bit more difficult than the iPhone usually makes its touch inputs, but my bigger issue is that "copy" pops up almost all the time I'm working with text. Because of its implementation, every time you want to place a cursor anywhere other than the end of a sentence, you get the option to cut/copy/paste. Isn't that a bit overkill? iPhone 3.0 software is adequately responsive. Apps open and close without too much of a fuss. Some people feel that it's a bit springier than the last 2.0 revision, but in our side-by-side testing, we found that it probably wasn't, and in many cases—like boot-up time—it's slower. Certain UI tweaks are added to make you feel like less time is being wasted, such as the implementation of a red exclamation mark next to outgoing, but as yet unsent, text messages. But some new features actually slow things down too: The animation tends to glitch when you pan from the Home screen over to Spotlight, and most of the time you click on a text field you'll be met with a similar brief delay. Though these setbacks are minor, if you want that slick 1.0 feeling back, your target phone should be the iPhone 3GS because only accelerated hardware can really fix the performance deficit caused by the in-flow of all these third-party apps. Stability? That's tough to judge, with most applications having just released their first updates for 3.0. But in terms of Apple's own apps, we've encountered occasional performance hiccups when emailing a photo or pulling up QWERTY in a text field. Nothing actually crashes, and it's certainly not noticeably less stable than earlier firmware versions, but you might sit there looking at a stuck screen once in a while. Maybe the biggest new feature in iPhone 3.0 is that apps can utilize push notifications. In other words, an app like AIM could pop up an instant message even if you weren't in that application. As you can imagine, there isn't a lot of third-party push content to test at the moment—possibly because Apple isn't approving background-notification-equipped apps until after 3.0 rolls out. So while we couldn't stack push apps to the sky to see how the iPhone could handle them, we did try Tap Tap Revenge 2. But Tapulous, makers of the game, clearly has some profile syncing issues—as we found in testing and documented within forums online. That leaves us with developer clips that have leaked of the AIM beta, which can give you a look at how Push notifications should work. We'll update this post with more push notification impressions as they are available, and will be discussing it further in our iPhone 3.0 apps roundup. Is Cellphone Tethering Worth It? 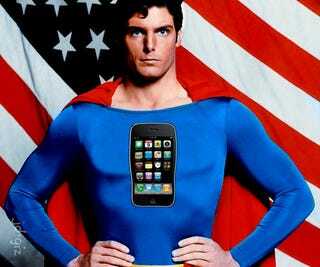 With the new firmware, the iPhone's biceps have never been bigger. Spotlight Search is a powerful, industry-leading tool. And functions like Find My iPhone—for paying MobileMe subscribers only—will surely become standard practice in the mobile-connected world of the future. It's just a shame that most other improvements feel like defensive maneuvers rather than a true watershed software revolution—most of this stuff should have been here already. Now that the phone's critics should be mostly silenced, we're interested to see where Apple goes from here. Let me guess: Multitasking? Really, lots of little improvements! Click to viewAdditional reporting from Matt Buchanan and Jason Chen. Check out our guide, Everything You Need To Know About iPhone 3.0, for even more info and screenshots.